We are a leading provider of high quality magnetic signs. We use industrial grade magnetic materials that are resistant to ultraviolet light, oils, solvents, greases. Our magnetic signs are rated at 6 years outdoors without fading or peeling. We use 30 mil magnetic sheeting. 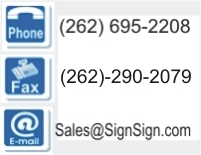 Signs for cars, trucks, vans. Any size or shape. Our signs won't damage your vehicle's finish. With 6yr outdoor rated vinyls, our signs are built to last. We use 30 mil Magnum Magnetic vehicle sheeting, not light weight imported magnetic sheeting. We can make any size, color you need. Our magnetic signs are made for severe environments indoors and out. Resistant to most solvents, fuels, grease, direct sunlight. Our vehicle signs won't damage your vehicle finish and can be removed and installed as needed. Low as $4 each in quantity. Our magnetic signs are an inexpensive way to advertise your business, campaign or special event. We guarantee the lowest prices, we'll beat any competitor pricing. For maximum life of your signs, proper care is important.